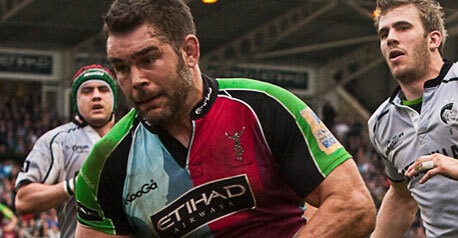 Harlequins veteran Nick Easter has announced he is retiring from playing. The 37-year-old former Quins and England captain, who was announced as the club’s defence coach in April, will now take on that role full time. Easter is Harlequins’ most-capped player, making 281 appearances and scoring 54 tries in the 12 years since he joined from Orrell. He also played in the 2007 World Cup final and became England’s oldest try scorer during the 2015 Six Nations Championship. “I realised that whether I’m playing or coaching, there was no possible way that I would be able to give 100 per cent to both of my roles at the same time,” Easter told the club’s website. After a try-laden 2005-06, helping Quins back to the top flight, Easter was a key player as the club won their first Premiership title in 2012. At the end of the 2013-14 season, he became Harlequins’ most-capped professional player, overtaking Ceri Jones’ record of 233. He also won Quins’ player of the year award four times, most recently in 2014-15. Easter made the first of his 54 appearances for England in 2007 and played in the last three World Cups. In his fourth Test match, he scored a record four tries against Wales at Twickenham, and skippered the side against Samoa in November 2010. At the 2015 World Cup, he scored three tries against Uruguay in to become the oldest hat-trick scorer in Test rugby history.